Fall and winter are the perfect time for casseroles and oven baked dishes. 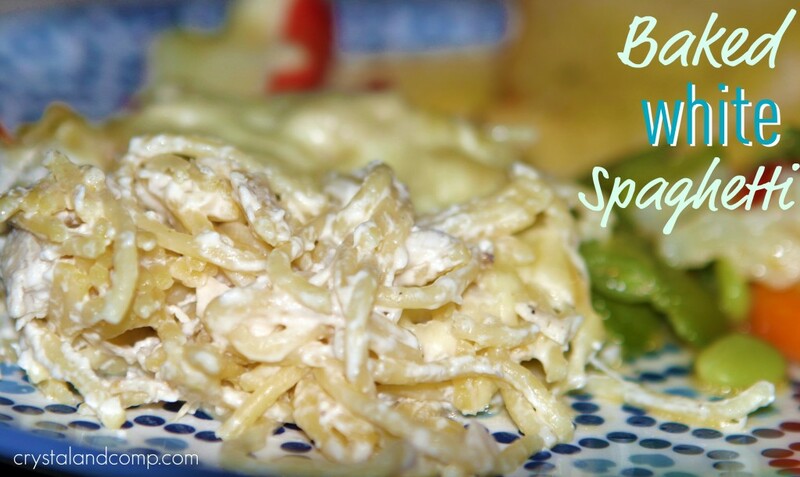 Here is an easy recipe that can certainly be done on a busy school night. 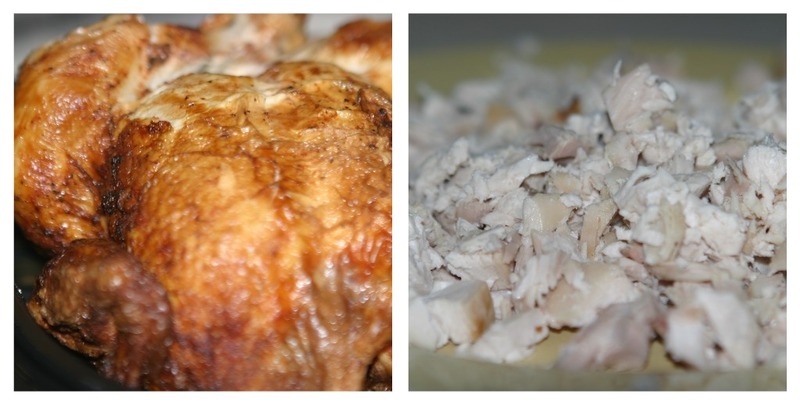 A rotisserie chicken from the deli section of the grocery store is the perfect way to have cooked chicken on hand. Grab one the next time you are at the store, chop it up and use it for a recipe. Or chop it up and freeze for a later recipe. You will want about 2 cups of cooked, chopped chicken for this recipe. While you are chopping up your chicken, bring a pot of water to a boil. 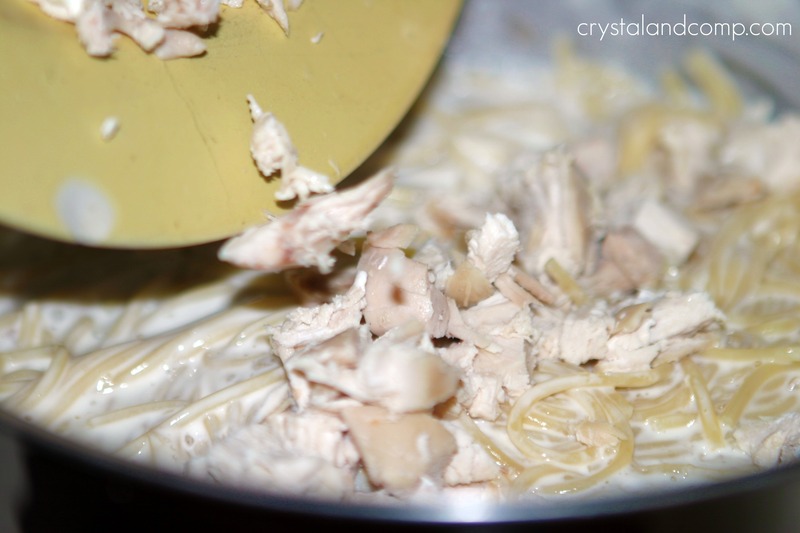 Once boiling, add about a pound and a half of spaghetti noodles to the pot. I like to break them in half. Boil for about 9 minutes. 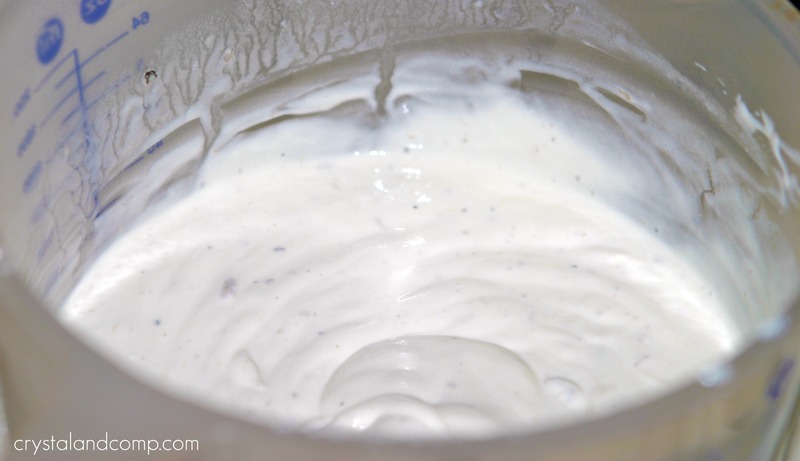 While your noodles are boiling, mix your soup, sour cream, milk and salt and pepper. Use a whisk to get all the lumps out of the soup. 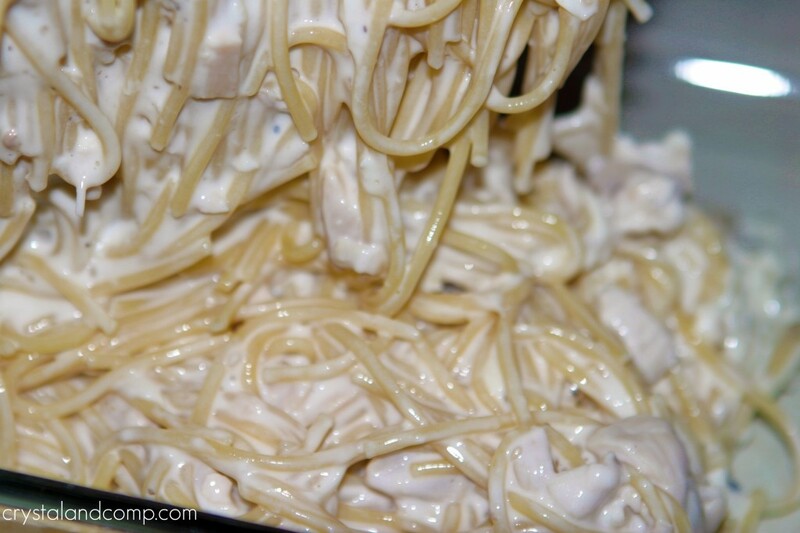 Once your noodles are done boiling, drain them. Return them back to the pot- no need to dirty up another bowl. Pour in the soup mixture. Pour in the diced chicken. Toss in one cup of the cheese. Stir and mix everything up well. Pour the spaghetti mixture into a 9×13 baking pan. 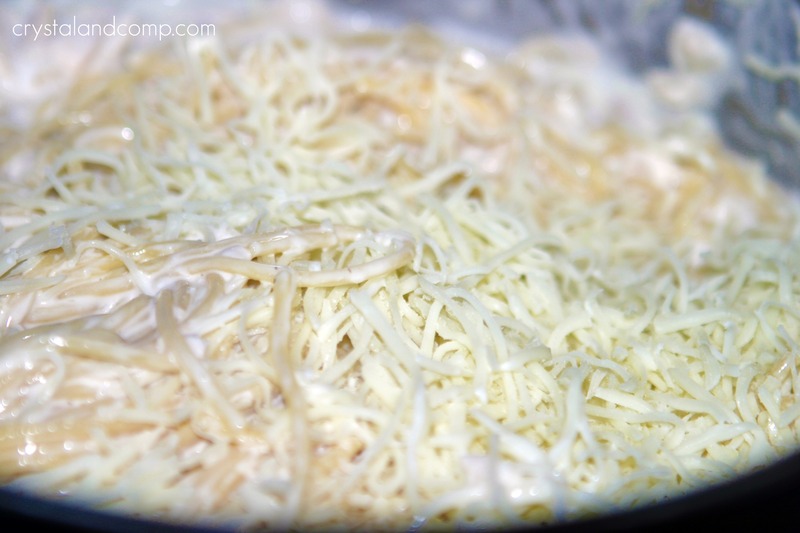 Top with the remaining cup of shredded cheese. 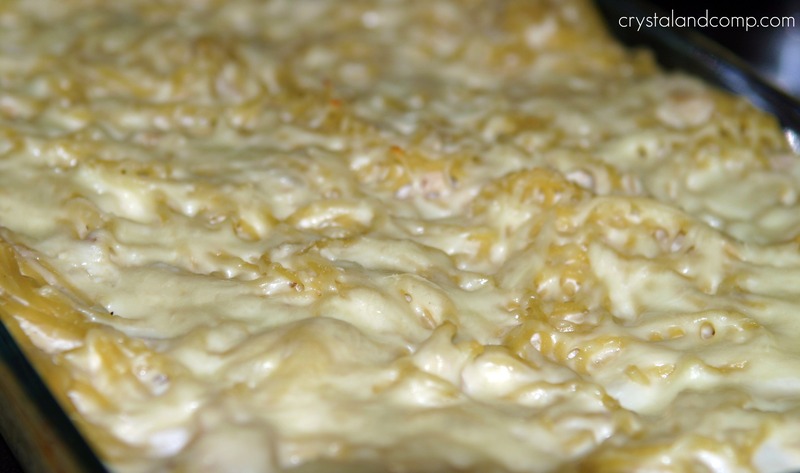 Pop it in the oven and bake at 350 degrees until bubbly- about 30 minutes. We served it with steamed veggies, apple slices and baked bread. You will want about 2 cups of cooked, chopped chicken for this recipe. Use leftover chicken or a rotisserie chicken. Set it aside. 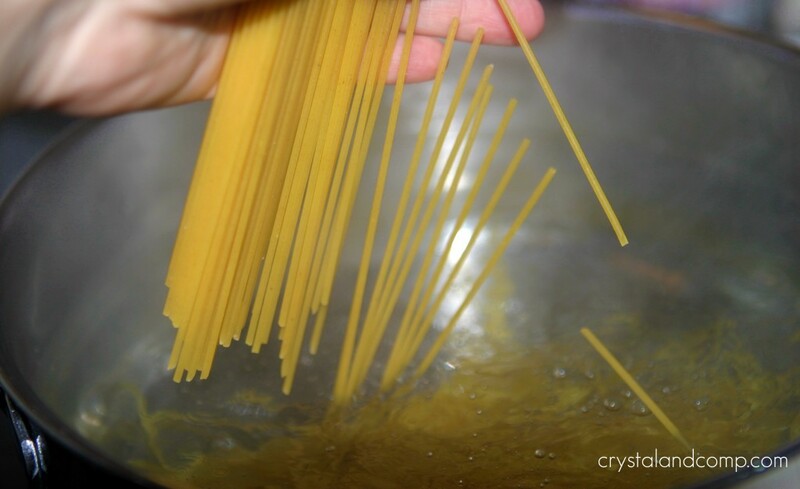 Once boiling, add about a pound and a half of spaghetti noodles to the pot. I like to break them in half. Boil for about 9 minutes. While your noodles are boiling, mix your soup, sour cream, milk and salt and pepper. Use a whisk to get all the lumps out of the soup. Return them back to the pot- no need to dirty up another bowl. Pour in the soup mixture. 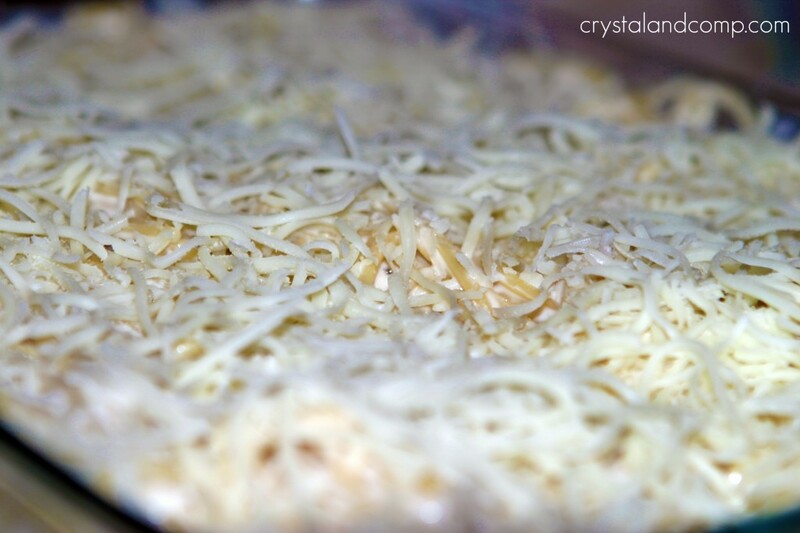 Toss in one cup of the cheese. Stir and mix everything up well. 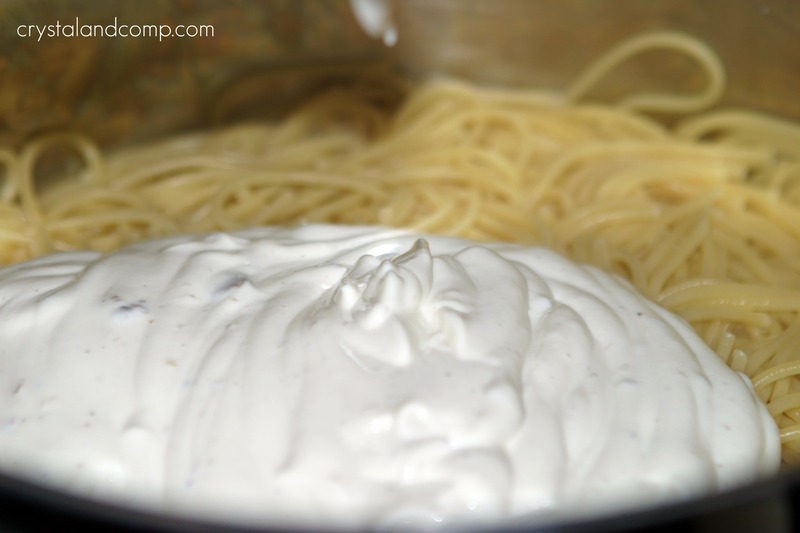 Pour the spaghetti mixture into a 9x13 baking pan. Spread it out evenly. Cook for about 30 minutes or until bubbly. A rotisserie chicken from the deli section of the grocery store is the perfect way to have cooked chicken on hand. Grab one the next time you are at the store, chop it up and use it for a recipe. Or chop it up and freeze for a later recipe. We served this with steamed veggies, apple slices and baked bread. Oooooooh…..Yummy! Can’t wait to try it. I invite you to share it in my blog party….Tuesday’s Tasty Tidbits. This looks really yummy. And pretty easy and fast to prepare. I will be great for a weekday meal, and all my family will eat it. Thanks for posting. This sounds delicious!!! In keeping with our goal to cut meat consumption in half, I am always looking for recipes that would allow substituting half the meat with finely chopped veggies. This would be an excellent recipe for that! This looks really good. I’m going to try it next week. Looks divine. Thanks for the recipe. Hi. This looks mmm mmm good. But did I miss what temp to cook it at? Good ole’ 350? I know I would love this. Those are all ingredients I enjoy. I would love for you to share at the Bacon Time fri-Monday linky. Awesome, Lisa. Thanks for pinning and sharing on Facebook. This is one of those wonderful “go to” casseroles that I love, it looks awesome! Thanks Miz Helen! It certainly is yummy and my family loves it. Great recipe… I added some basil, garlic salt and some sweet marsala wine and it turned out wonderfully with a bit more flavor!! 🙂 Not clumpy at all- nice and creamy! I also used 10 oz of milk. Hi! I’m new at cooking. What is the temperature for this to cook at? I saw 350 earlier in a comment but no response to her. I want to try it without burning he house down 🙂 thanks! Yes, 350 degrees is the temperature. I wonder can you make this in the morning and refrigerate it and bake when u get home? You could certainly assemble in the morning and refrigerate and then pop it in the oven when you get home. Oooooohhh! This looks really yummy, have never had baked spaghetti before and would never have thought to prepare it in this way but can’t wait to give it a try! Omg a friend of mine made this for me,it is amazing I could not stop eating it!!! The flavor is out of this world!! !